"Great post-workout snack that will keep you filled for hours! The taste of the banana and the peanut butter cover the taste of the spinach completely. I freeze my bananas and spinach then prepackage everything for the week! Substitutions include rice or nut milks or vanilla yogurt." 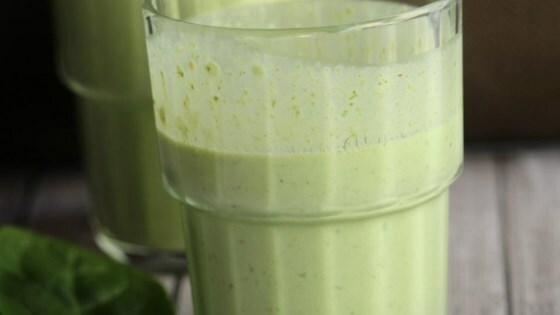 Blend milk, yogurt, banana, peanut butter, spinach, and ice cubes until smooth. I did not care for this recipe...and I like spinach in all its forms. I made as directed. I use unsweetened almond milk instead of milk and yogurt...this is an addicting breakfast smoothie! Will also try with kale.